Although re-roofing is not necessarily a glamorous home improvement, it is certainly an important one. If you are planning a new roof, consider these 5 upgrades that will make your roof more beautiful, functional, and long-lived. Re-roofing your home is not the most glamorous of home improvements. You’ll note that HGTV shows rarely even mention the roof. Unlike decks, kitchens, and baths, the roof is not really something you’d invite your friends over to admire. But re-roofing does present some appealing opportunities for the homeowner who wants to reduce maintenance and unnecessary expenses for years to come. Here are five roof upgrades to consider when you are about to reroof your home. Unlike masonry and metal chimney caps that are designed to keep rain and (if screened) birds and other critters out of your chimney, airtight caps are about saving energy. When your fireplace is not in use, warm air from inside your home is literally gushing out the chimney when the weather is cold. The damper in your firebox does little to stop it because it is not airtight. Ask your roofer about installing an airtight chimney cap while the roof is being worked on. These units are spring-activated. To open the chimney cap, you just tug on a steel cable that’s attached to a bracket inside your fireplace. Pull it shut after your fire is completely out. An airtight cap has the added benefit of keeping animals from nesting inside your chimney. If you’ve ever experienced damage from an ice dam, you might want to invest a little extra when re-roofing to install eave flashing. These peel-and-stick bituminous membranes are applied prior to shingling to a depth that is 2 feet inside the exterior wall plane (three feet on low-pitched roofs). The membranes self-seal around roofing fasteners, forming a watertight seal over the eaves, which are the portion of the roof most susceptible to ice dams. Bituminous eave flashing may also be specified for other vulnerable roof areas, such as over valleys and around skylights and dormers. Attics become like furnaces in summer if they are not well ventilated. That heat buildup radiates to the rooms directly below the attic, making them uncomfortable. To keep the attic—and your home—cooler, be sure your roofing contractor installs ridge vents across the top of your roof. Barely noticeable from the street, ridge vents allow air movement beneath the ridge cap shingles. For ventilation to be effective, soffit vents located under the eaves draw cooler air into the attic as hot air is being expelled. Gable vents, which are located near the roof peak of exterior walls, may also be needed to ensure adequate airflow. A cooler attic means your home will be more comfortable during the summer without your having to spend a fortune on air conditioning. The recommendation for a cooler roof used to be to select light-colored or white shingles. This option, however, wasn’t always aesthetically appealing to homeowners. Today’s new reflective shingles come in assorted colors, from popular slate to wood tones. The granules not only reflect the sun’s radiation but also quickly reemit much of the heat that is absorbed. Depending on your climate and your home’s construction, a cool roof can save between 7 and 15 percent of your cooling costs. While you’re having your home reroofed, it’s also a good time to scrap your old gutters and install new ones—especially if your existing gutters are misaligned or unsightly. Gutter systems with built-in curved hoods, such as those from Englert LeafGuard, are designed to be maintenance-free. 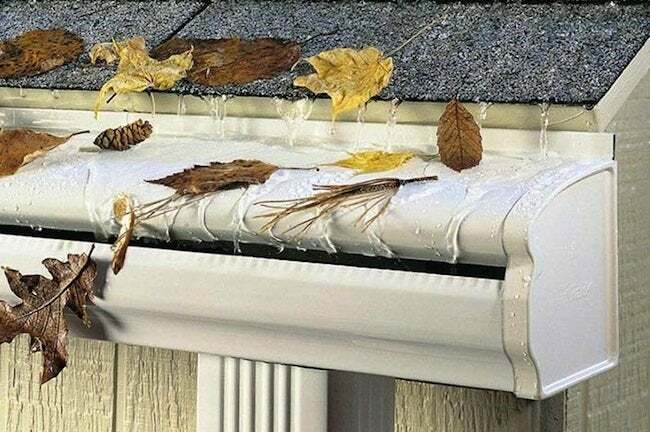 The patented design works on the scientific principle of water adhesion, allowing rainwater to travel down and around its curved hood and into the gutter while deflecting leaves. This prevents clogs and unsightly staining on gutters and siding due to gutter overflow. It also means you can forget about the messy and hazardous chore of climbing a ladder to clean your gutters. 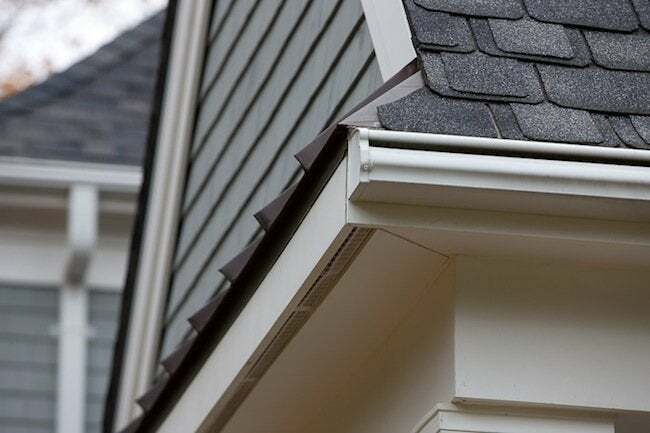 The one-piece, seamless LeafGuard Brand gutters are generously sized for the heaviest of downpours, and homeowners like the clean architectural way they define the roof eaves. They even come in a variety of colors, allowing you to choose a tone that will complement your trim, roofing, and siding. Use LeafGuard’s design tool to get a preview of how the gutters will look with your new roof. With all these improvements, maybe a new roof is worth celebrating. This post has been brought to you by Englert LeafGuard. Its facts and opinions are those of BobVila.com.